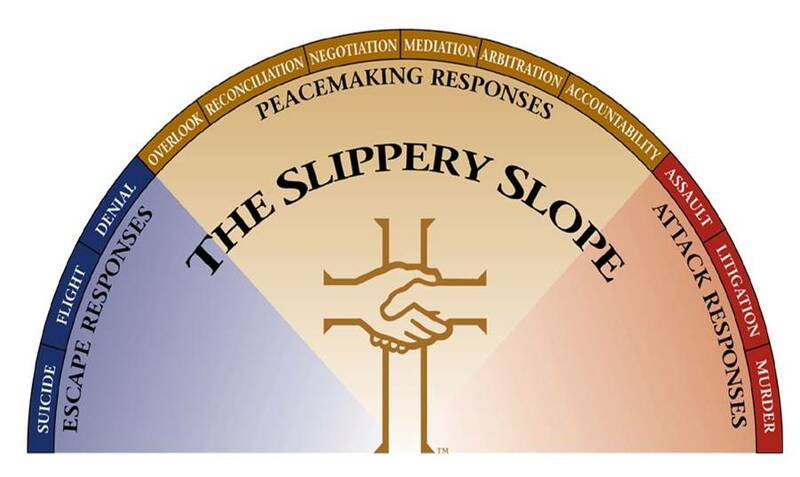 Make every effort to keep the unity of the Spirit through the pond of peace (Eph. 4:3 NIV). When conflict arises, maintaining unity becomes a challenge. Conflict is a difference in opinion or purpose that frustrates someone’s goals or desires. Some conflicts are neither good nor bad (e.g., a difference of opinion about what color to paint the church). Although we should seek unity in our relationships, we should not demand uniformity. But many conflicts are the direct results of sinful attitudes and behavior. James writes, “What causes quarrels and what causes fights among you? Is it not this, that your passions are at war within? You desire and do not have, so you murder. You covet and cannot obtain, so you fight and quarrel” (James 4:1-2). How should we handle conflict? Often it can be quite tricky. If possible, so far as it depends on you, live peaceably with all (Rom. 12:18). These responses are used by people who are more interested in avoiding a conflict than in resolving it (denial, flight, suicide). With these responses, the focus is on “me.” I am looking for what is easy, convenient, or nonthreatening for myself. These responses are used by people who are more interested in winning a conflict than in preserving a relationship (assault, litigation, murder). With these responses, the focus is on “you.” I am blaming you and expecting you to give in and solve the problem. These responses are commanded by God, empowered by the gospel, and directed toward finding just and mutually agreeable solutions to conflict. With these responses, the focus is on “us.” I am aware of everyone’s interests in the dispute, especially God’s, and I am working toward mutual responsibility in solving the problem. Overlook. “Good sense makes one slow to anger, and it is his glory to overlook an offense” (Prov. 19:11). “Above all, keep loving one another earnestly, since love covers a multitude of sins” (1 Peter 4:8). Reconciliation. “If your brother sins against you, go and tell him his fault, between you and him alone. If he listens to you, you have gained your brother” (Matt. 18:15). “Brothers, if anyone is caught in any transgression, you who are spiritual should restore him in a spirit of gentleness” (Gal. 6:1). Negotiation. Even if we successfully resolve relational issues, we may still need to work through material issues related to money, property, or other rights. “Let each of you look not only to his own interests, but also to the interests of others” (Phil. 2:4). Mediation. “But if he does not listen, take one or two others along with you, that every charge may be established by the evidence of two or three witnesses” (Matt. 18:17). Arbitration. “Do if you have such cases, why do you lay them before those who have no standing in the church? I say this to your shame. Can it be that there is no one among you wise enough to settle a dispute between the brothers?” (1 Cor. 6:4-5). Accountability. “If he refuses to listen to them, tell it to the church. And if he refuses to listen even to the church, let him be to you as a Gentile and a tax collector” (Matt. 18:18). As we move from the left side of the slope to the right (clockwise), our responses tend to go from being private to being public. 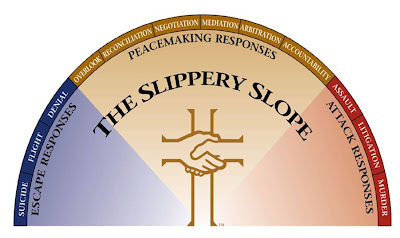 The further you move from the personal peacemaking zone in either direction, the greater your costs will be. The promise for peacemakers is that they will be called sons (or children) of God. Why? 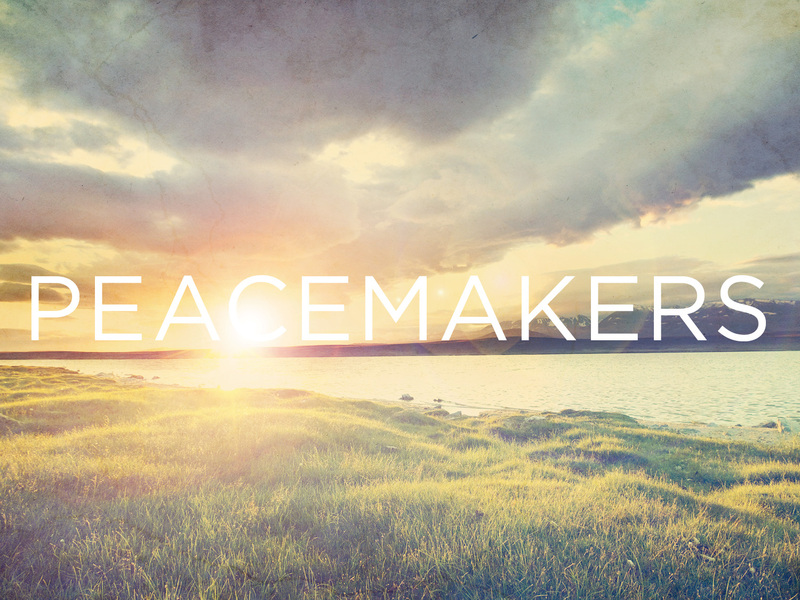 Because peacemakers reflect the character of God. God is a “God of peace” (Phil. 4:9). Conflict is an opportunity to glorify God, serve others, and grow to be like Christ. There is a connection between Jesus’ reputation and our unity. Jesus prayed, “I do not ask for these only, but also for those who will believe in me through their word, that they may all be one, just as you, Father, are in me, and I in you, that they also may be in us, so that the world may believe that you have sent me” (John 17:20-21). How did Jesus react to conflict? After Peter (one of Jesus’ best friends) denied him, Jesus met with Peter privately and they were reconciled. The life of Joseph illustrates how conflict can provide opportunities. His jealous brothers intended to murder him but eventually sold him as a slave (Gen. 37). What did Joseph do when he finally met his brothers years later in Egypt? He sought reconciliation. He said to them, “Do not fear, for am I in the place of God? As for you, you meant evil against me, but God meant it for good, to bring it about that many people should be kept alive, as they are today” (Gen. 50:19-20). "If I speak in the tongues of men and of angels, but have not love, I am a noisy gong or a clanging cymbal. And if I have prophetic powers, and understand all mysteries and all knowledge, and if I have all faith, so as to remove mountains, but have not love, I am nothing. If I give away all I have, and if I deliver up my body to be burned, but have not love, I gain nothing" (1 Cor. 13:1-3). …but have not love, I am a noisy gong or a clanging cymbal (v. 1). …but have not love, I am nothing (v. 2). …but have not love, I gain nothing (v. 3). The use of our spiritual gifts must be motivated by love. “The fruit of the Spirit is love, joy, peace, patience, kindness, goodness, faithfulness, gentleness, self-control” (Gal. 5:22-23). Spiritual gifts are what we do. Spiritual fruit is what we are. Who we are is more important than what we do (even if there is outward success). Tim Keller writes, “Spiritual gifts without spiritual fruit is like a tire slowly losing air” (“Ministry Can Be Dangerous to Your Spiritual Health”). True love was demonstrated by the cross. “God shows his love for us in that while we were still sinners, Christ died for us” (Rom. 5:8). In the NT, love and serving are inseparable. “For God so loved the world, that he gave his only Son” (John 3:16). “Through love serve one another” (Gal. 5:13). How can we receive from God but not give to others? We are not to be consumers; we are to be servants. Jesus said, “Even the Son of Man came not to be serve but to serve, and to give his life as a ransom for many” (Mark 10:45). “Just as I have loved you, you also are to love one another” (John 13:34). “If God so loved us, we also ought to love one another” (1 John 4:11). And [Christ] gave the apostles, the prophets, the evangelists, the shepherds and teachers, to equip the saints for the work of the ministry, for building up the body of Christ, until we all attain to the unity of the faith and of the knowledge of the Son of God, to mature manhood, to the measure of the stature of the fullness of Christ, so that we may no longer be children, tossed to and fro by the waves and carried about by every wind of doctrine, by human cunning, by craftiness in deceitful schemes. Rather, speaking the truth in love, we are to grow up in every way into him who is the head, into Christ, from whom the whole body, joined and held together by every joint with which it is equipped, when each part is working properly, makes the body grow so that it builds itself up in love (Eph. 4:11-16). 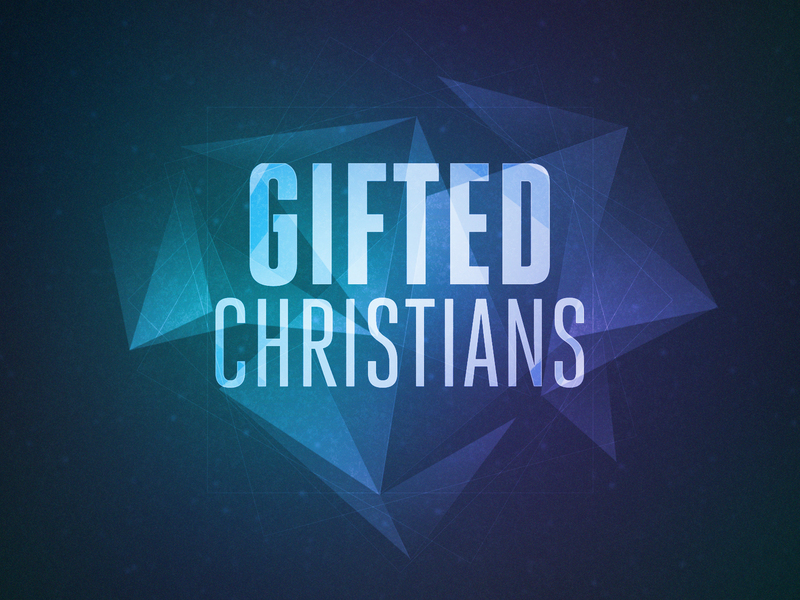 God has given spiritual gifts to Christians. A spiritual gift is a God-given ability for service. 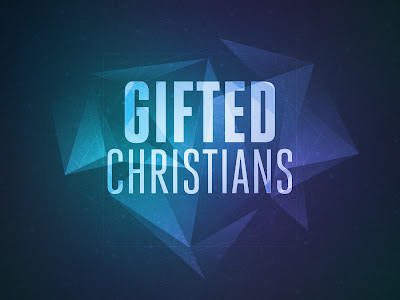 In part one of this series, we learned five truths about spiritual gifts: (1) every spiritual gifts is important; (2) spiritual gifts are expressed in unique ways; (3) spiritual gifts do not determine spiritual maturity; (4) spiritual gifts do not limit you to only one kind of service; and (5) spiritual gifts must be developed through constant use. And [Christ] gave the apostles, the prophets, the evangelists, the shepherds and teachers, to equip the saints for the work of the ministry, for building up the body of Christ (vv. 11-12). In churches, there are generally two types of people: consumers and servants. Don't go to church with a shopping list. Go to church with a to-do list. We must have a heart of a servant, not the heart of a consumer. “Each of you should look not only to your own interests, but also to the interests of others. Your attitude should be the same as that of Christ Jesus: Who being in very nature God, did not consider equality with God something to be grasped, but made himself nothing, taking the very nature of a servant” (Phil. 2:4-7 NIV). How Can I Discover My Gift? …when each part is working properly, makes the body grow so that it builds itself up in love (v. 16). It is essential that every Christian is using his or her gift(s). Here are five suggestions for discovering your spiritual gift(s). 1. Find out what service is needed. Why not start where your church has a need? If you find out that this is not the best fit for you, you can move on to something else. But it’s important to begin your search with a servant’s heart. 2. Consider what you enjoy doing. “If any of you lacks wisdom, let him ask God” (James 1:5). If you are willing to serve, God will eventually reveal to you your area of giftedness. Church leaders or trusted Christian friends can help you determine what gift(s) you have. Of course, it’s essential that those giving counsel speak “the truth in love” (Eph. 4:15). 5. Don’t just sit there; do something. Don’t wait until you discover your gift. Start serving.